We’d love your help. Let us know what’s wrong with this preview of The Last of the Wild West Cowgirls by Kay Turnbaugh. Goldie Griffith was one of a kind. She boxed. She wrestled. She rode bucking broncos in the Buffalo Bill Wild West traveling tent shows, and a newspaper referred to the pretty young bronco buster as a "Heller in Skirts." She was one of the first professional female athletes. She was an actor and stunt rider for the brand-new western movies that were taking the country by s Goldie Griffith was one of a kind. She boxed. She wrestled. She rode bucking broncos in the Buffalo Bill Wild West traveling tent shows, and a newspaper referred to the pretty young bronco buster as a "Heller in Skirts." She was one of the first professional female athletes. She was an actor and stunt rider for the brand-new western movies that were taking the country by storm. She was married during a Wild West at Madison Square Garden with a crowd of 8,000 in attendance. She became a rancher and owned several restaurants in the mountains of Colorado. She trained dogs for the war and applied to be the first policewoman in San Francisco. Was there anything she couldn't do? She didn't think so. When she learned the truth about her cowboy husband she pulled out her show gun, but even a trip to jail didn't stop her. This is the (amazingly) true story of Goldie Griffith's life. With over 120 photographs and images. A 2009 WILLA Literary Award finalist. To ask other readers questions about The Last of the Wild West Cowgirls, please sign up. Recommends it for: Anyone interested in American history. Disclaimer: I received this book as part of Goodreads First Reads program. This is the biography of Goldie Griffith. Born in 1893, she went into show business as a lady wrestler in the early 1900s. Enamored by a young cowboy in a traveling western show, she decides to follow that path and finds that she has a definite aptitude for all that being a cowgirl entailed. She eventually joins Buffalo Bill's show, and is with it when it goes bankrupt. She continues plying her trade as a cowgirl for a whi Disclaimer: I received this book as part of Goodreads First Reads program. This was fun to read because of the Western history, the stories of Nederland, CO, and the fact that it was all true. Kay Turnbaugh was born and raised in Colorado, and she now lives in the small mountain town of Nederland where for 27 years she published the town's weekly award-winning newspaper. After retiring from the newspaper business, she researched and wrote The Last of the Wild West Cowgirls, a biography of Goldie Griffith who rode bucking broncos in Buffalo Bill's Wild West shows and ended up owning rest Kay Turnbaugh was born and raised in Colorado, and she now lives in the small mountain town of Nederland where for 27 years she published the town's weekly award-winning newspaper. After retiring from the newspaper business, she researched and wrote The Last of the Wild West Cowgirls, a biography of Goldie Griffith who rode bucking broncos in Buffalo Bill's Wild West shows and ended up owning restaurants in Nederland. 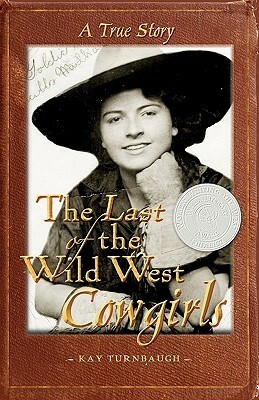 The Last of the Wild West Cowgirls won a WILLA Literary Award for Creative Nonfiction. Around Nederland, is part of Arcadia Publishing's Images of America Series. A children's book (for ages 8-12) about the mountain pine beetle, The Mountain Pine Beetle-Tiny But Mighty. Afoot & Afield: Denver, Boulder, Fort Collins, and Rocky Mountain National Park, a hiking guide with 184 trails, maps, and photos of hikes along Colorado's Front Range. With co-author Alan Apt.